Mushrooms are truly magical. We have always used mushrooms as food and medicine. In fact, many mushrooms have long been used throughout Asia for medicinal purposes. There are at least 270 species of mushroom that are known to have various therapeutic properties. The practice of using mushrooms in Chinese herbal medicines has been recorded in early records of the Materia Medica. Although mushrooms are still harvested in their natural habitats, our ability to cultivate many different mushroom species has improved greatly over the past few decades. As a result, large numbers of scientific studies on medicinal mushrooms over the past three decades, especially in Japan, China and Korea, have confirmed the traditional uses and also demonstrated new applications for health benefits. While much attention in recent years has focused on various immunological and anti-cancer properties of certain mushrooms, they also offer other potentially important health benefits, including antioxidants, anti-hypertensive and cholesterol-lowering properties, liver protection, as well as anti-inflammatory, anti-diabetic, anti-viral and anti-microbial properties. These properties have attracted the interest of many pharmaceutical companies, which are viewing the medicinal mushroom as a rich source of innovative biomedical molecules. Below is a brief description of 5 popular medicinal mushroom varieties: Coriolus versicolor (Turkey Tails), Ganoderma lucidum (Reishi), Agaricus blazei (add the common name Himematsutake), Polyporus umbellatus (add the common name Zhu Ling), Hericium erinaceus (Lion’s Mane). Coriolus versicolor (“multicolored mushroom”), also known as Trametes versicolor, is a mushroom readily found in woodlands in China and Europe and is the most commonly found polypore in the oak woods of the Pacific Coast in the U.S. 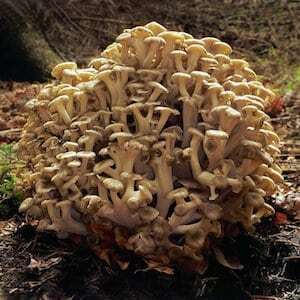 It grows in clusters or tiers on fallen hardwood trees and branches, frequently in large colonies. As its name implies, it is often multi-colored, with contrasting concentric bands, variously appearing in shades of white, gray, brown, black, blue or even red. It has a thin, velvety fruiting body, usually 2- 7 cm wide, fans out into wavy rosettes, giving rise to its popular name, Turkey Tails. Uses: Anti-cancer action: PSK has been shown to be effective against several cancers, including cervical cancer, in combination with other therapeutic agents; appears to enhance the effect of radiation therapy; PSP significantly lessened the side effects of conventional medical protocols used in the treatment of cancers of the esophagus, stomach and lungs, as well as significantly increasing the rate of remission in esophageal cancers. Cardiovascular health: Lowered cholesterol in animal studies. Immune enhancement: PSK increases interferon production, as well as scavenging superoxide and hydroxyl free radicals, has demonstrated anti-viral activity, possibly even inhibiting HIV infection. Ganoderma lucidum (“shining skin”) is a visually striking polypore with a hard woody texture and a shiny, varnished appearance. It primarily grows on oaks, plum trees and other hardwoods, and has a 2-20 cm semi-circular or kidney-shaped cap, variously colored white, yellow, blue, red, purple or black. Ganoderma species are found worldwide, though the Chinese and Japanese species have been studied the most extensively for their therapeutic value. It is somewhat rare in the wild, and so in recent years has been commercially cultivated, making it more widely available. In the West it is usually known by its Japanese name, reishi. Uses: Athletic performance: Enhances oxygenation of the blood, reducing and preventing altitude sickness in high altitude mountain climbers. Cardiovascular health: Lowers cholesterol levels, reduced blood and plasma viscosity in a controlled study of patients with high blood pressure and high cholesterol. Immune enhancement: Potent action against sarcoma, stimulates macrophages and increases levels of tumor-necrosis factor (TNF-α) and interleukins. Immunopotentiation: Anti-HIV in in vitro and in vivo animal studies; protects against ionizing radiation. Liver health: Reduced liver enzyme levels (SGOT and SGPT) in hepatitis B patients. Respiratory health: 60-90 % of 3,000 patients with chronic bronchitis showed clinical improvement, especially older patients with bronchial asthma. Regenerates bronchial epithelium (bronchial tract lining). Polyporus umbellatus (“umbrella-like polypore”), also known as Grifola umbellata, is a white-to-gray mushroom that grows in dense rosettes from a single stem. It is found in deciduous woodlands in China, Europe and Eastern and Central North America, growing from dead tree stumps or the roots of birches, maples, beeches and willows. Uses: Anti-cancer actions: Used in the treatment of lung and other cancers; has demonstrated pronounced anti-tumor activity in in vitro and in vivo animal studies; helps reduce the side-effects of chemotherapy. Immune enhancement: stimulates and enhances the performance of the immune system and accelerates production of IgM and strengthens the power of monocytes. Liver health: can help alleviate symptoms of chronic hepatitis; was used as part of an herbal formula that cured 17 of 39 patients with cirrhosis of the liver, and brought about significant improvement in 19 others. Hericium erinaceus (“spiny hedgehog”) is a snow-white, globe-shaped fungus composed of downward cascading, icicle-shaped spines. 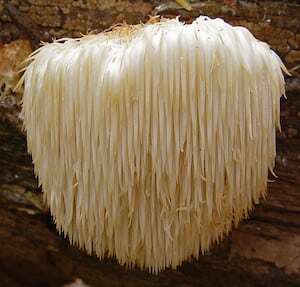 Its striking appearance gives rise to its various common names, Lion’s Mane, Monkey’s Head and Hedgehog Fungus. It grows up to 40 cm in diameter on dead or dying broadleaf trees — such as oak, walnut, maple and sycamore — and is found in China and Japan, as well as parts of Europe and North America. It is considered a gourmet mushroom, long popular with forest folk, with a flavor variously described as reminiscent of lobster or eggplant. Uses: Anti-cancer effects: Helps in the treatment of esophageal and gastric cancers, may extend the life-span of cancer patients. Digestive enhancement: Promotes proper digestion; effective against gastric and duodenal ulcers and gastritis. Immune enhancement: Protects the gastrointestinal tract against environmental toxins, inflammation and tumor formation, an extract was used as part of a protocol that helped increase T and B lymphocytes in mice. This blog is a repost of an article published by Dr. Isaac Eliaz, M.D., M.S., L.Ac. It is not intended to treat, diagnose or cure. For more information, please visit www.dreliaz.org. My sister suffers from Primary Biliary Cirrhosis, can you give me more information about this please. Right now we are not in a position to recommend treatment and can only share the exciting research in this field. We recommend clicking the link at the bottom of this post we shared with permission from By Dr. Isaac Eliaz or contacting your doctor or another medical professional. I have Endometrial Stromal Sarcoma, stage 4B. My tumours have been stable since 2004. I would like to try the Turkey Tail and Reishi as adjunct treatments. Are the mushrooms eaten at a particular quantity and regularity? Or are there preparations available ? If both options are available, which would be most effective? He talks about curing his mother’s advanced cancer with Turkey Tail! There is zero evidence that his mother was cured by turkey tail or that the form of turkey tail she took has any benefit against the breast cancer she was diagnosed with. The only treatments she received with any evidence of efficacy against cancer consisted of conventional chemotherapeutics. Hi Katherine, we’re very sorry to hear that. Currently we’re not in a position to prescribe a certain treatment. We suggest bringing any questions to your doctor or contacting a medical professional in this field. We’re excited to share the latest research, but unfortunately we’re not qualified to do more than that. Good luck and best wishes! I love this page. Can I recieve a magazine by mail.?? This blog is just wonderful! Thank you! You’re geniuses. I’m surprised you didn’t mention Lion’s Mane and it’s ability to trigger the growth of neurons and nerves. AlohaMedicinals.com has the BEST medicinal mushroom products in the world. Dr. Holliday is an innovator in the field. The prices can’t be beaten either, especially when buying in bulk(kilo size tin of powder). I am a Chinese guy,work with a lot of Chinese fungi scientists,Through a lot of clinical treatment, we find a cure for cancer by fungus combination treatment effect far beyond the radiotherapy and chemotherapy and no side effects. Very much hope that you will be able to see my message and contact us,We want to make our own contribution to fight against cancer for humanity . Hi Ray. Would like to know more of your fungus combination treatment. Thank you. If you assumed that he was referring to a combination of fungi, you would be mistaken. The only evidence for any benefit from fungi against cancer is from clinical trials of purified polysaccharides derived from them in combination with conventional treatments (chemotherapy, radiation, and surgery). Even then, relapse-free survival of patients is not always found and even in trials with positive outcomes, the best results have shown a meager increase in years of survival for a minor percentage of patients. Kenneth, who pays you to leave comments like this? Chemotherapy and radiation poison the body in hopes of a cure. Anything supporting the body’s natural healing process is beneficial. Thousand of years worth of Earth’s ingredients supporting the healing process is enough evidence to keep my interest and the interest of people who have suffered by the side effects of the other. The longevity of life with a healing process that supports far outweighs our current brainwashed thinking of cancer treatment. The facts are out there, just hard to find due to the influence of the Western medicial conglomeration. Where can I purchase medicinal mushroooms ? I can get to NYC if I need to. How can I find out how to prepare? Are supplements better to use or would you mix the two? Thank you very much Lisa for the 2 links you mentioned in your comment. 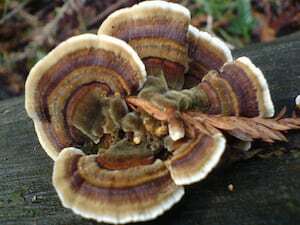 Contrary to what the post suggests, Trametes versicolor (synonym, Coriolus versicolor), a fungus commonly known in North America as “turkey tail”, is not the same as PSK (Polysaccharide Kureha or Krestin), a purified polysaccharide derived from a particular strain of the cultured mycelium; nor can one expect a crude extract of the fungus or its mycelium to produce the same effects, either in animals or humans. PSK has been prescribed to cancer patients in Japan AFTER conventional treatments (chemotherapy, radiotherapy, and surgery). So far, however, the evidence suggests that PSK may at best produce a minor prolongation in the lifespan of patients after conventional treatments for colorectal, lung, or breast cancer. Chemotherapy poisons the body and to have a minor prolongation of lifespan with the PSK demonstrates the strength in supporting healing of the body. Clinical trials have been proposed, but turned down by traditional medicine and at our governmental level. As for the statement concerning reishi, that “60-90 % of 3,000 patients with chronic bronchitis showed clinical improvement, especially older patients with bronchial asthma”, the correct figure is over 2000 patients. The original report only concerned case reports from hospitals in China in the 1970s where patients with chronic bronchitis received treatment with tablets composed of a syrup of the fungus. In the absence of placebo-controlled, double-blind, randomized clinical trials, the case reports amount to anecdotal accounts rather than scientific evidence of efficacy. Moreover, what the authors reported was an overall or aggregated sum of effectiveness, which is not the same as statistically significant improvement, and would include cases reported to show only minor improvement. Lacking sufficient controls, the number of cases that would have resolved or improved without treatment or with placebo is unknown. 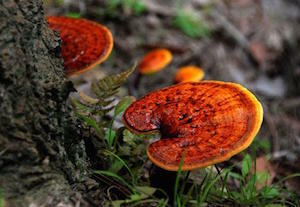 In 2007, researchers in Taiwan reported that extracted triterpene-rich fractions of Ganoderma tsugae (a fungus closely related to reishi or G. lucidum) produced anti-inflammatory effects in the airways of mice in a model of allergic asthma. Mice treated with the triterpene-rich extracts showed significantly decreased bronchial airway hyper-responsiveness, inflammatory cytokines (interleukin-4 and interleukin-5), total infiltrating eosinophils and leukocytes, bronchoalveolar lavage fluid eotaxin, and less lung damage compared to control mice. Like prednisolone-treated mice, they also showed lower levels of ovalbumin-specific immunoglobulin G1, a T-helper-2-related antibody. However, unlike the effects of prednisolone, the number of splenocyte cells was not decreased, indicating that the triterpene-rich fractions inhibited inflammation of the airway without overall suppression of the immune system. To date (2016), however, well-controlled human clinical trials of triterpene-rich fractions or any other extracts of either fungus remain to be conducted in patients with bronchial asthma or chronic bronchitis. As to the statement of Dr. Eliaz concerning the fungus lion’s mane (Hericium erinaceus), “Uses: Anti-cancer effects: Helps in the treatment of esophageal and gastric cancers, may extend the life-span of cancer patients”, there are no human clinical trials to show either effect. Whereas fractionated extracts of the fungus have shown antitumor activity in mice with transplanted tumor cells, the same effects have yet to be shown in humans. Decades of research has shown that high rates of tumor inhibition found in rodents administered extracts of various fungi are not found in humans, either from crude extracts or isolated polysaccharides. Apparently, rodents with transplanted tumor systems are far more responsive to the antitumor effects of fungi than people with developed cancer. Very surprised to not read anything about chaga! I have been using it for several months (tea and double extraction) and it has helped me a great deal with osteoarthritis! ? Really like the article 🙂 I have recently discovered the birch polypore mushroom in the UK and have been making tea from the small mushrooms I have collected. I have also been taking Reishi and Cordyceps off and on for few years . I thoroughly recommend them. I think Kenneth needs to consider that absence of evidence is not evidence of absence. No-one but pharmaceutical companies can afford the huge amount of money that would be needed to do a randomised, placebo controlled crossover study. They will not do this for a naturally occurring molecule because they cannot patent it – to subsequently pay for the study (and make profit). In addition to this there are ethical problems with the design of any such test. How would you test the relative efficacy between a treated cohort and a group that has cancer but is used as a control group (without treatment). It cannot be done. We therefore see a bind: No naturally occurring molecule can be “scientifically” proven because of overwhelming commercial and ethical considerations in this sphere. That necessarily leaves us with 2000 years or so of practical use in multiple cultures for the same purpose as an efficacy yardstick. Of course pharmaceutical industry shills will still decry the practice. They make billions from synthetic patented cancer drugs and will not give up a monopolistic position without a fight. Whilst on the subject of Industry shills (paid apologists for the pharmaceutical industry) there was allegedly “no evidence” that Vioxx caused heart-attacks. But 60,000 deaths later, $321 million in fines and $4.85 BILLION in restitution by the makers (Merk) gives a pretty solid lesson that lack of evidence is not evidence of absence. Let us also consider Thalidomide. “Absence of evidence” of mutagenic effects on foetuses was not evidence of absence of these effects. When dealing with industry shills, I do not believe that anything they say is acceptable, unless I understand the financial relationships that they have with the drugs industry. Likewise I do not trust their research unless full data and methods are published. I urge any reader not to accept anything from the pharmaceutical industry at face value. The mouth of this gift horse needs to be looked into very thoroughly. I commend the book “Bad Pharma” by Dr. Ben Goldacre. This is massively credible and well researched book by an ethical and concerned doctor. Well said, Jonathan. Thank you for the book recommendation. A friend deligently researched alternative, natural medicine for her brother who had colon cancer. But after all her research he refused the product she ordered so she took the medicine while visiting me. She had two large skin tags of some sort that she said “just fell off” during the course of taking this medicine! I lost contact with her and cannot remember the name of the medicine. However, being a firm and compliant acupuncture patient, I stumbled across a box of, what I thought, was old tea bags the other day. IT WAS GANODERMA LUCIDUM SPORE POWDER! Although the box said good for 2 years, I began using it in again as it was very expensive. Figured it won’t hurt BUT worst that can happen is that it won’t help but…. Next day I felt different. My appetite increased drastically, bowel and bladder function improved. Depression seemed a bit better. I began having different neorological feeling in my feet. Lucidum sounds familiar. Could this be what she researched and purchased? I need to order again. Thanks. Any literature on which of the mycoherbs are NOT contraindicated with Warfarin?